The Chicago Tribune has a fascinating article about 23 year-old Pioneer grad, Caleb Stevens, who received medical care in Chicago recently after being wounded in Syria. Caleb was fighting as a volunteer with the Kurdish YPG Militia Deir ez-Zor, Syria. Stevens was shot in the calf by a sniper while trying to retrieve a rifle. 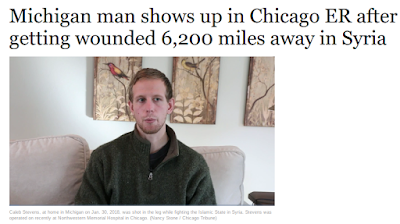 He was initially treated in a hospital in Baghdad, followed by a hospital in Jordan, before he flew to Chicago O'Hare and eventually received treatment at Northwestern Memorial Hospital. Stevens is currently recuperating at his home in Ann Arbor. The Trib's article goes into great depth on Stevens' story and the phenomenon of international volunteers in the YPG. It's well worth your read. Caleb I realize you have probably had a lot of media attention, but if this ends up finding its way to you, and you'd be interested in an interview with a local publication, drop me a line ben.connorbarrie @ gmail.com.